This ad for Sachs from the 1953 Manhattan telephone directory lists the store at 3rd Avenue and 150th Street along with three others. Matthew X. Kiernan on his Flickr site has the following on Sachs and their store at Third Avenue at 150th Street, "Israel Sachs (1870–1949) opened F. Sachs at Second Avenue and 106th Street in East Harlem in 1896. 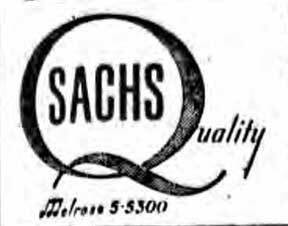 He incorporated as Sachs Quality Furniture in 1927, Sachs Quality Stores in 1947. By 1919, they had added a store at 3963 Third Ave. and 173rd Street in the Bronx. By 1931 they had a new main store at Eighth Avenue and 35th Street and by 1946 Bronx locations along Third Avenue and 134th, 150th and 173rd streets. In 1940, they took over the former Blumstein’s Department Store and had a new entrance designed by Morris Lapidus (destroyed). The store was closed by the end of the 1970s." In 1898 Trow's New York City Directory listed Sachs Fenelon, carpets at 1996 Second Avenue. This became Sachs Finin, carpets a year later, and then Sachs Finan furniture at 2058 Second Avenue in 1900. Directories continued to list either Finan, Finin, or Finnan Sachs at 2058 Second Avenue from 1900 to 1903. Then the address changed to 2063 or 2065 Second Avenue, where they were listed as either one of the variations on Finan or simply F. Sachs through 1923. These Second Avenue locations were in Manhattan. The store at 2883 Third Avenue, the Bronx, appeared first in the 1940 New York telephone directory. This listing continued through 1978. To date I have found no information on a Finan (by whichever spelling) Sachs. Possibly this was a business name adopted by Israel Sachs (1871-1949), who seems to be sole founder of the business. Israel Sachs appeared in the 1900 U. S. Census, age 28, born August 1871 Germany, immigrated 1890, living at 2056 Second Avenue, Manhattan. At that time his two sons, Nathan and William, were three and two years old respectively. Israel Sachs's obituary, New York Times, 30 Sept. 1949, pg. 23, read, "Israel Sachs of 115 Central Park West, founder and president of Sachs Quality Stores, furniture, furnishings and apparel, and a leader in philanthropies, died Wednesday at Grossinger's, Ferndale, N. Y., where he was on vacation. His age was 75. Born in a small Russian town, a son of Charles and Leah Rose Sachs, he came to the United States at the age of 20. Two years later, in 1896, he opened his first store on East 102d Street in Harlem. During the ensuing half century, his concern grew greatly under his supervision and guidance. Joined by his sons, Nathan and William, he led his concern into the field of community welfare, opening his store auditoriums to 'teenage canteens to give young people in their neighborhoods wholesome recreational facilities. Mr. Sachs also sponsored free adult education courses, free puppet shows for school children and consumer advisory panels. He was a pioneer user of radio advertising. More recently, beginning in the period just before the recent war, he sponsored an advertising series devoted to the American Way that won him many awards. ... Surviving are his widow, Fannie; three sons, Nathan, William and Abraham M.; a daughter, Mrs. Jeannette M. Hirsch; a brother, Max, and a sister, Mrs. Jennie Miller. A funeral service will be held today at 1 P. M. in Temple Shaare Zedek, 212 West Ninety-third Street. Burial will be in Lebanon Cemetery." 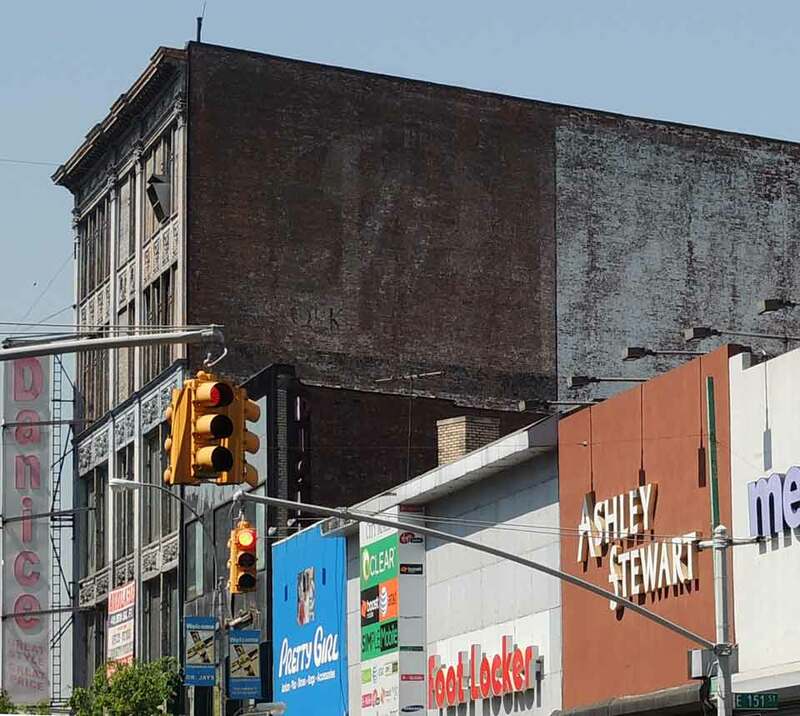 In the 1925 New York State Census both William Sachs (1898-1996) and Nathan Samuel Sachs (1896-1956) lived at 1726 Topping Avenue, the Bronx, and their occupations were "Furniture Business." Nathan Sachs's obituary, New York Times, 7 May 1956, pg. 27, read, "Nathan S. Sachs, president of Sachs Quality Stores Inc., a retail furniture chain, died yesterday of a heart attack in his home, 15 West Eighty-first Street. His age was 59. Mr. Sachs was elected president of the stores corporation on November, 1949, soon after the death of his father, Israel Sachs who had founded the organization in 1896. Born in New York, Mr. Sachs was graduated from New York University Law School in 1917. Like his father he was widely known for his philanthropic activities. As recently as last January, Mr. Sachs had been re-elected treasurer of the Jewish Counciliation [sic] Board of America. He also was a past chairman of the distribution committee of the Federation of Jewish Philanthropies. Mr. Sachs was a past president of the National Retail Furniture Association and the American Retail Federation, and had been the first president of the Retail Credit Institute of America. He also had been a director of the Furniture Stores Guild. A past president of the National Foundation for Consumer Credit, Mr. Sachs also had been president of the Associated Furniture Dealers of New York, vice president of the Hospital Council of New York and first president of the Philanthropic Council of the Home Furnishings Industry. The National Retail Furniture Association honored Mr. Sachs with its 1947 Cavalier award, a silver cup given annually to the 'furniture merchant who, in the conduct of his business, has best served his industry, his community and his country.' Surviving are his widow, Mrs. Lillian Sachs; two sons, Charles and Martin Sachs; two daughters, Mrs. Sylvia Gilbert and Mrs. Rosalie King; his mother, Mrs. Fannie Sachs; two brothers, William and Abraham; a sister, Jeanette, and seven grandchildren." In 1956, on the death of Nathan Sachs, Richard C. Sachs became president of Sachs Quality Stores, "Sachs Quality Stores, home furnishings chain, has announced the election of Richard C. Sachs as president. He succeeds Nathan S. Sachs, who recently died. Martin Sachs has been named vice president and treasurer, a new post. Daniel S. King, a vice president, has been added to the board of directors" (New York Times, 22 June 1956, pg. 35). Richard C. Sachs, a son of William Sachs, was president of Sachs in 1981 when the company filed for bankruptcy, "Sachs New York, operator of 11 furniture stores in New York City and Huntington, L. I., filed yesterday for protection from creditors under chapter 11 of the Federal bankruptcy law. Richard C. Sachs, president of the 85-year-old chain, said in his petition that high interests costs on accounts receivable and a general softening of the home furnishing business had constricted the company's cash position, making it impossible to pay suppliers promptly. ..." (New York Times, 19 Nov. 1981, pg. D23).